Prokaryotes are ubiquitous. They cover every imaginable surface where there is sufficient moisture, and they live on and inside of other living things. In the typical human body, prokaryotic cells outnumber human body cells by about ten to one. They comprise the majority of living things in all ecosystems. Some prokaryotes thrive in environments that are inhospitable for most living things. Prokaryotes recycle nutrients—essential substances (such as carbon and nitrogen)—and they drive the evolution of new ecosystems, some of which are natural and others man-made. Prokaryotes have been on Earth since long before multicellular life appeared. Microbial mats or large biofilms may represent the earliest forms of life on Earth; there is fossil evidence of their presence starting about 3.5 billion years ago. A microbial mat is a multi-layered sheet of prokaryotes ([link]) that includes mostly bacteria, but also archaea. Microbial mats are a few centimeters thick, and they typically grow where different types of materials interface, mostly on moist surfaces. The various types of prokaryotes that comprise them carry out different metabolic pathways, and that is the reason for their various colors. Prokaryotes in a microbial mat are held together by a glue-like sticky substance that they secrete called extracellular matrix. Fossilized microbial mats represent the earliest record of life on Earth. A stromatolite is a sedimentary structure formed when minerals are precipitated out of water by prokaryotes in a microbial mat ([link]). Stromatolites form layered rocks made of carbonate or silicate. Although most stromatolites are artifacts from the past, there are places on Earth where stromatolites are still forming. For example, growing stromatolites have been found in the Anza-Borrego Desert State Park in San Diego County, California. Evidence indicates that during the first two billion years of Earth’s existence, the atmosphere was anoxic, meaning that there was no molecular oxygen. Therefore, only those organisms that can grow without oxygen—anaerobic organisms—were able to live. Autotrophic organisms that convert solar energy into chemical energy are called phototrophs, and they appeared within one billion years of the formation of Earth. Then, cyanobacteria, also known as blue-green algae, evolved from these simple phototrophs one billion years later. Cyanobacteria ([link]) began the oxygenation of the atmosphere. Increased atmospheric oxygen allowed the development of more efficient O2-utilizing catabolic pathways. It also opened up the land to increased colonization, because some O2 is converted into O3 (ozone) and ozone effectively absorbs the ultraviolet light that would otherwise cause lethal mutations in DNA. Ultimately, the increase in O2 concentrations allowed the evolution of other life forms. Some organisms have developed strategies that allow them to survive harsh conditions. Prokaryotes thrive in a vast array of environments: Some grow in conditions that would seem very normal to us, whereas others are able to thrive and grow under conditions that would kill a plant or animal. Almost all prokaryotes have a cell wall, a protective structure that allows them to survive in both hyper- and hypo-osmotic conditions. Some soil bacteria are able to form endospores that resist heat and drought, thereby allowing the organism to survive until favorable conditions recur. These adaptations, along with others, allow bacteria to be the most abundant life form in all terrestrial and aquatic ecosystems. 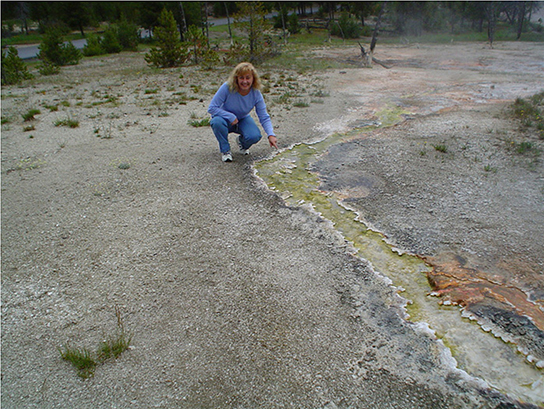 Other bacteria and archaea are adapted to grow under extreme conditions and are called extremophiles, meaning “lovers of extremes.” Extremophiles have been found in all kinds of environments: the depth of the oceans, hot springs, the Artic and the Antarctic, in very dry places, deep inside Earth, in harsh chemical environments, and in high radiation environments ([link]), just to mention a few. These organisms give us a better understanding of prokaryotic diversity and open up the possibility of finding new prokaryotic species that may lead to the discovery of new therapeutic drugs or have industrial applications. Because they have specialized adaptations that allow them to live in extreme conditions, many extremophiles cannot survive in moderate environments. There are many different groups of extremophiles: They are identified based on the conditions in which they grow best, and several habitats are extreme in multiple ways. For example, a soda lake is both salty and alkaline, so organisms that live in a soda lake must be both alkaliphiles and halophiles ([link]). Other extremophiles, like radioresistant organisms, do not prefer an extreme environment (in this case, one with high levels of radiation), but have adapted to survive in it ([link]). One example of a very harsh environment is the Dead Sea, a hypersaline basin that is located between Jordan and Israel. Hypersaline environments are essentially concentrated seawater. In the Dead Sea, the sodium concentration is 10 times higher than that of seawater, and the water contains high levels of magnesium (about 40 times higher than in seawater) that would be toxic to most living things. Iron, calcium, and magnesium, elements that form divalent ions (Fe2+, Ca2+, and Mg2+), produce what is commonly referred to as “hard” water. Taken together, the high concentration of divalent cations, the acidic pH (6.0), and the intense solar radiation flux make the Dead Sea a unique, and uniquely hostile, ecosystem1 ([link]). What sort of prokaryotes do we find in the Dead Sea? The extremely salt-tolerant bacterial mats include Halobacterium, Haloferax volcanii (which is found in other locations, not only the Dead Sea), Halorubrum sodomense, and Halobaculum gomorrense, and the archaea Haloarcula marismortui, among others. Microbiologists typically grow prokaryotes in the laboratory using an appropriate culture medium containing all the nutrients needed by the target organism. The medium can be liquid, broth, or solid. After an incubation time at the right temperature, there should be evidence of microbial growth ([link]). 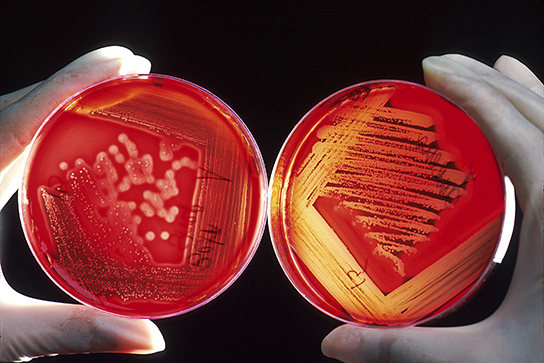 The process of culturing bacteria is complex and is one of the greatest discoveries of modern science. German physician Robert Koch is credited with discovering the techniques for pure culture, including staining and using growth media. His assistant Julius Petri invented the Petri dish whose use persists in today’s laboratories. Koch worked primarily with the Mycobacterium tuberculosis bacterium that causes tuberculosis and developed postulates to identify disease-causing organisms that continue to be widely used in the medical community. Koch’s postulates include that an organism can be identified as the cause of disease when it is present in all infected samples and absent in all healthy samples, and it is able to reproduce the infection after being cultured multiple times. Today, cultures remain a primary diagnostic tool in medicine and other areas of molecular biology. Some prokaryotes, however, cannot grow in a laboratory setting. In fact, over 99 percent of bacteria and archaea are unculturable. For the most part, this is due to a lack of knowledge as to what to feed these organisms and how to grow them; they have special requirements for growth that remain unknown to scientists, such as needing specific micronutrients, pH, temperature, pressure, co-factors, or co-metabolites. Some bacteria cannot be cultured because they are obligate intracellular parasites and cannot be grown outside a host cell. 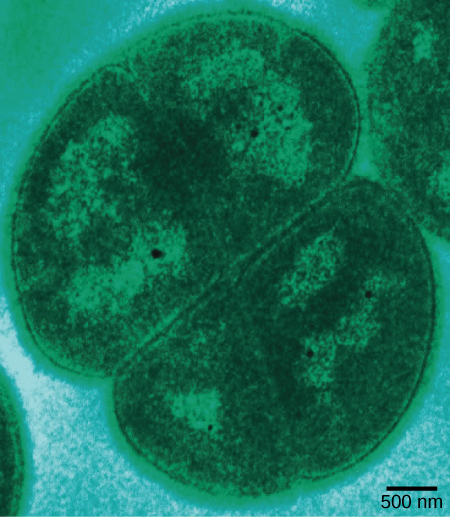 Until a couple of decades ago, microbiologists used to think of prokaryotes as isolated entities living apart. This model, however, does not reflect the true ecology of prokaryotes, most of which prefer to live in communities where they can interact. A biofilm is a microbial community ([link]) held together in a gummy-textured matrix that consists primarily of polysaccharides secreted by the organisms, together with some proteins and nucleic acids. 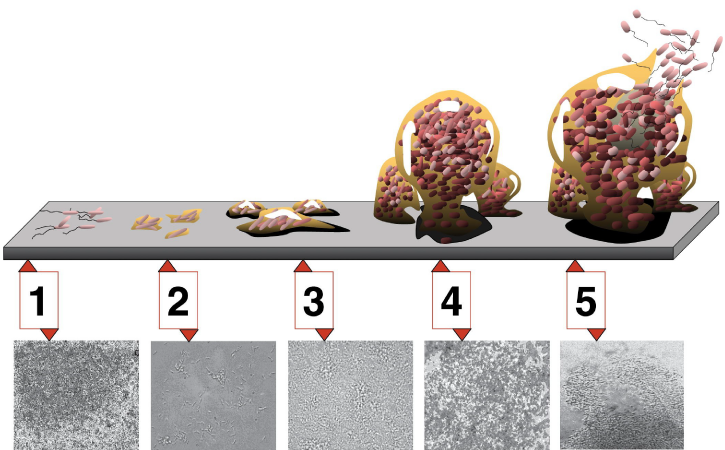 Biofilms grow attached to surfaces. Some of the best-studied biofilms are composed of prokaryotes, although fungal biofilms have also been described as well as some composed of a mixture of fungi and bacteria. Prokaryotic Diversity by OpenStaxCollege is licensed under a Creative Commons Attribution 4.0 International License, except where otherwise noted.